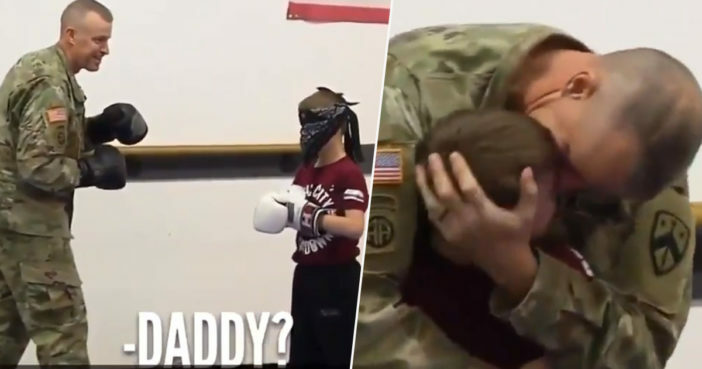 A nine-year-old boy has melted hearts across the world after his military father surprised him during a Taekwondo session. Following a 10-month deployment with the Tennessee Army National Guard’s 230th Sustainment Brigade, Staff Sgt. Rob Cesternino had returned home to Lebanon, Tennessee. During his deployment, Rob spent time serving in Kuwait, Jordan and southern Syria, checking in with his family via Facetime. Rob decided to surprise his youngest son, Luca Cesternino, by turning up four days earlier than planned, and the video of their reunion has caused floods of tears on social media. Rob, his wife Leah, and several of their friends somehow managed to keep Rob’s early return under wraps, with young Luca having no idea whatsoever his dad had come home until he was right in front of him. Luca had been practicing Taekwondo at Success Martial Arts Center in Lebanon, sparring blindfolded against his instructors. Without Luca knowing, Rob stepped in during the blindfolded sparring exercise. Luca only twigged who his new sparring partner was when he heard a very familiar nickname. When he said, ‘Hey Shib.’ He always used to call me Shib when I was little. He wanted to nickname me, so he called me Shib. The cute nickname reportedly originated from when Luca used to sing the Georgia Satellites’ Hippy Hippy Shakes as the Shibby Shibby Shakes when he was little. Tear-jerking footage, which has since gone viral, shows an ecstatic Luca removing his blindfold and throwing his arms around his dad with excitement. I was like, wow. Everybody came here to see my dad and me. It’s just excitement. I felt joy in my heart. I will never leave his side. As a military brat myself (I’m 69 yo now) I relate to this boy’s burst of emotions that moment he sees his dad. I have been there & done that enough times during my dad’s deployments & never tire of watching other families go through it themselves. So heartwarmingly genuine! We are both sitting here enjoying this, but the person we both have to thank is his mom and my wife, Leah. It starts and ends with her. She makes us better. If you are a husband or a wife of a service member, if you are a child of a service member, they deserve more applause than we get, because they have a tougher row to hoe. And Wilson County, the city of Lebanon, we’ve never lived in a community who takes better care of their own, ever. And they took care of us while we were gone. It’s tough. We don’t give enough thought to how tough it is on the family we leave behind. My Father was in the Navy for 20 years and i remember feeling just like this young man at his age, I’m almost 50. Thanks Dad for your service !! So few understand the burdens our military carry with them. I never get tired of these vids.